New Cardinal Seasons Mini-Print Set Release! Pressed for space for art on your walls? 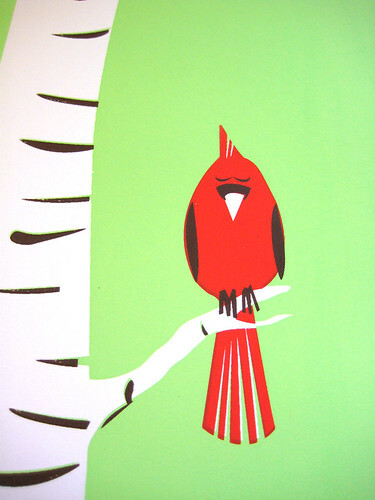 Like our hand silkscreen printed Cardinal Seasons screen prints, but don’t have the room? We’ve solved all of your problems. You’re welcome! We now also offer our Cardinal Seasons prints in a super easy-to-frame 8.5×11 inch (21.6 cm x 27.9 cm) size that’s just as stylish as the larger silkscreen printed versions. Boom! Please note that these are Indigo print versions (not silkscreens) of our super popular (and larger) silkscreen Cardinal Seasons art prints. The Indigo print process is a very high quality digital printmaking press that produces beautiful vibrant color and super sharp detail. Here’s the background story on this series: We have lots of Cardinals here all year round. I love looking out of my window and seeing their amazing scarlet red color jumping out from wherever they are, and whatever they are up to. Our Cardinal Seasons Mini-Print Set is now available for purchase in our webshop here and also in our Etsy store here, for just $35 for all four prints! Paper: Beautifully textured Mohawk Via Bright White Felt Finish, 100lb cover weight which is an archival, no-acid, American manufactured paper by Mohawk using Wind Power electricity. Produced with 30% post consumer recycled content. Forest Stewardship Council (FSC) and Green Seal Certified. Size: Printed on 8.5″ x 11″ (21.6 cm x 27.9 cm) paper, image area measures 6″x8″ (15.2 cm x 20.3 cm). Designed to be flexible and fit an 11×14 sized frame with a matte as is, or you easily trim down the border area so that it can fit or 8.5 x 11 or 8×10 sized standard frame quite easily. Click any images above to purchase or for more info. Black Friday, Cyber Monday & Holiday shopping bonus! Click to visit my Etsy Shop! 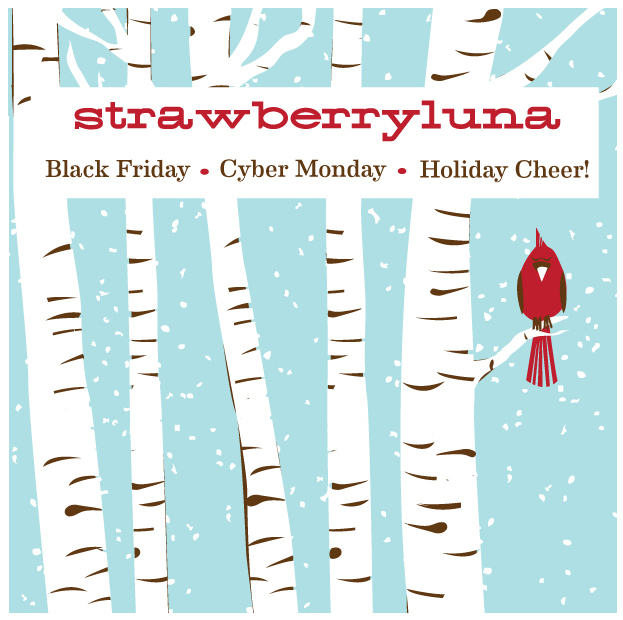 We’re offering a few types of Holiday Cheer here at strawberryluna HQ and we wanted to tell you about ’em. 1. The Value Added Deal: Through either our website here or our Etsy shop here, we’re offering a FREE BONUS print with any purchase of $15 or more. Yep! Freebie! 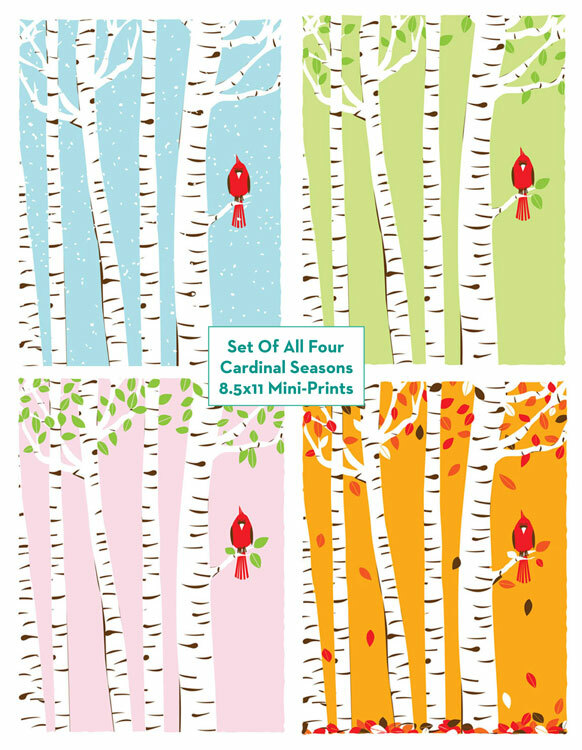 We’re releasing a new set of giclee prints, sized for smaller spaces and smaller walls in the form of our popular Cardinal Seasons print series, now also at a wee 8″x10″ size super high quality giclee print. So easy to frame! The Deal: During Checkout in both our webstore or in our Etsy shop just mention “Holiday Bonus Cardinal” in the notes to seller section. 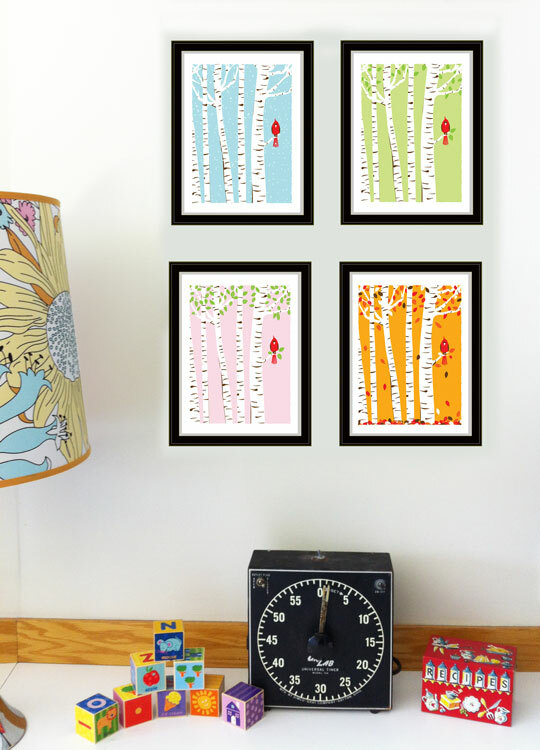 (Don’t forget to tell us which print you would like for you bonus!) 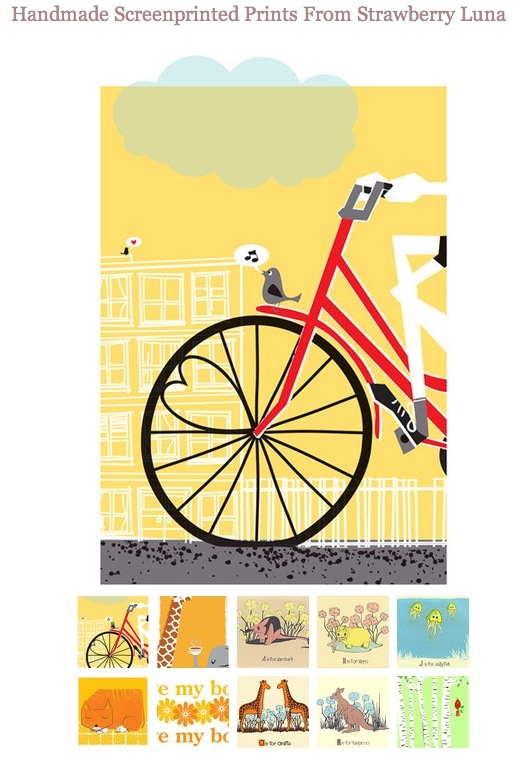 And we’ll hook you up with a free 8″x10″ giclee print of your choice with *any purchase of $15 or more*. Easy-peasy! 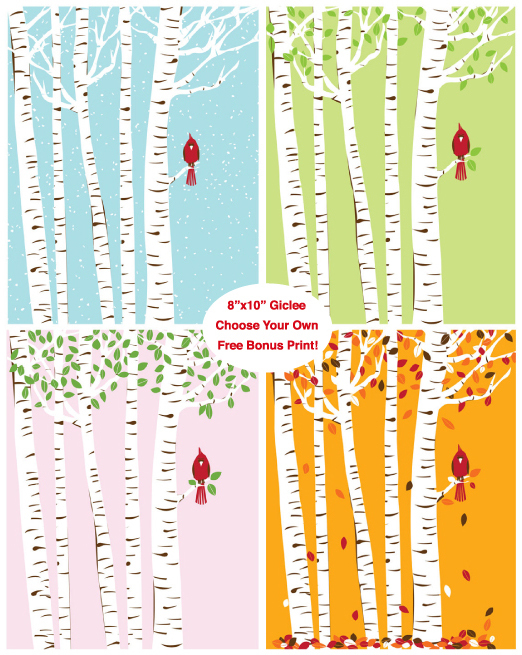 This Holiday Bonus print deal is good through 12/15. 2. The Classic Black Friday Deal: Through our Etsy shop (only!) get a solid 15% off of your entire purchase by using coupon code BLACKFRIDAY15 now through midnight 11/27 and then! (That’s right, it’s not over yet!) On Monday, 11/28 use the web-happy coupon code CYBERMONDAY15 for 15% off of your entire purchase. Boom! Good through 11/29. Yep! You get one extra day from us, ’cause that’s how we roll. 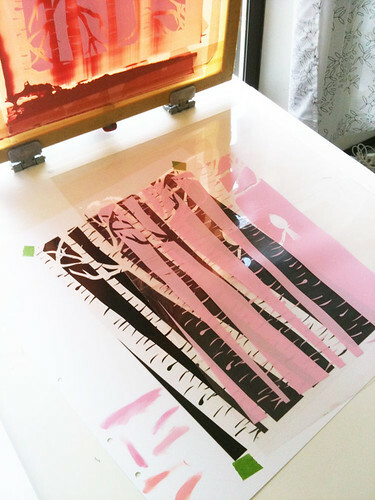 Oh happy day, ohdeedoh’s piece on our prints! Click here to read the full post on ohdeedoh! I woke up to a happy surprise today, the fantastic blog ohdeedoh wrote a really lovely piece on our prints! ohdeedoh is the perfect intersection of home & kid-friendly design, which is a really cool niche, as it insists on being very livable rather than high-concept focus. I love that. We’re just tickled that author Sarah Rae Trover at ohdeedoh found our work and wrote such a fresh post about us. 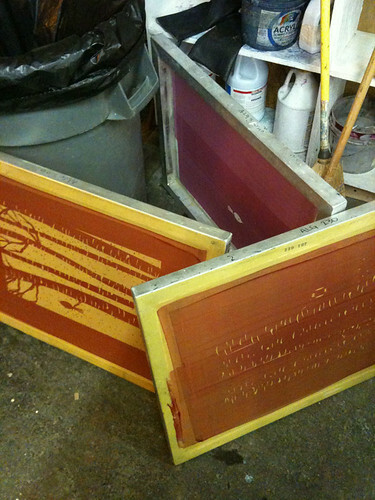 With the hand silkscreen printing process being so labor intensive (a “simple” 3-color print, edition of 100 takes 6-10 hours to complete), I can’t tell you how refreshing and awesome it is to see that a great blog like ohdeedoh gets it. Thank you so much! With the full post right here, or click on the above image. All of the featured prints above (and more, of course!) are available at my website here, or click any of the below images to see larger images and more information on my hand silkcreen printed art prints & posters. Huzzah! It’s summer, fully. 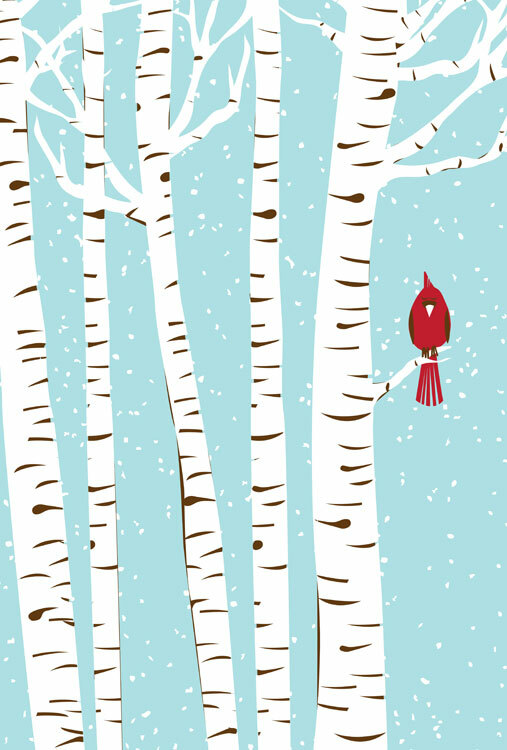 The 2nd of 3 new releases today, this is my Summer Cardinal art print. And I have to be honest, it’s been done printed, cut, and ready to fly home since the first day of summer. Mea culpa on the slow to blog it here (in)action. But, summer is all about being laid back right? Right. Sweet. Quick story about this print. It was originally designed as a 5-color print, with a transparent metallic gold ink as the last layer. Somehow in my head, rather than expecting the metallic gold to work as a true transparent ink and blend with the pink base/1st color to make a new color (in this case, a peachy coral), I thought that it would sit on top. Essentially making a misty soft metallic gold overlay all subtly sparkly. Yeah….no. Nope. (See last photo below.) I pulled two prints and decided to stop there, making this a 4 color print. Summer Cardinal is a part of my new Seasons series. This is the seventh print in series of seasonal prints that I’ll be releasing. Ready? Here’s the mind-blowing part = there will be 4 per year. Crazy, right? This year for the Seasons series, in 2010 I am doing things a little differently, rather than making a new image for each season, I’ve decided to follow the same bright red fellow in the same scene, across all 4 seasons. And here for Summer Cardinal, in honor of the softer, breezier and warmer life of summer, our little red fellow is enjoying the gathering sunset of a lovely night ahead in twilight pinks. Summer Cardinal is my 4-color, all hand screenprinted art print with tender summer night pink, bark brown, scarlet red, fresh-leaf green hand mixed and non-toxic water based inks. All prints are hand signed and titled. Edition of 500. Size: 16 x22 inches (39.4 cm x 55.9 cm.) Paper: archival Cougar, White 100lb cover weight. $25. This print is ready to fly home with you and available for purchase here at my website now! 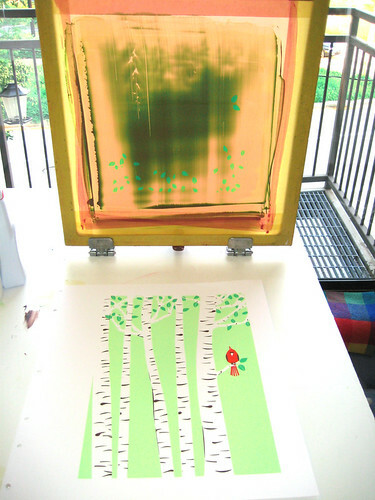 Process shots of my hand screenprinting this print are below for you as well. Click any of the images to see more information and to see more photos from my Flickr account too. 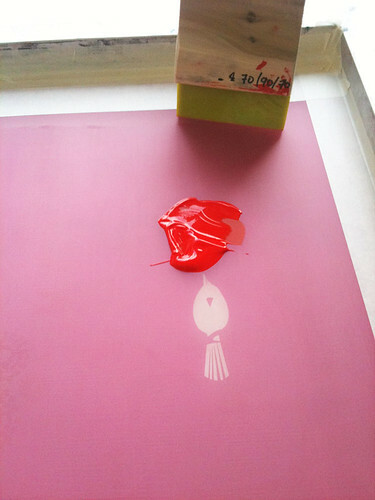 1st color registering for my 4-color "Summer Cardinal" hand screenprinted art print. Click to see more process photos and for more info. Just a lil guy. Click for more process photos and more info. 2nd color printed, and my printing apron, from Etsy seller Amievoltaire. Click for more process photos and more info. The 5th color FIAL. Click for more info and more process photos. 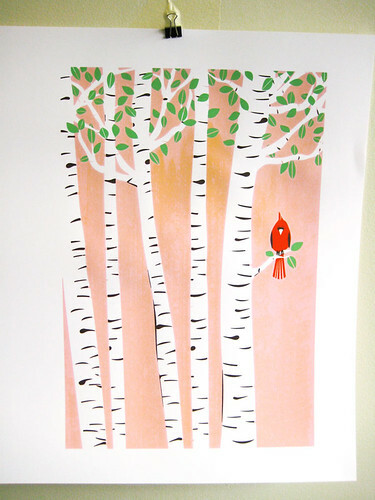 Freshly off the presses and now available: you are looking at my Spring Cardinal, the spring 2010 art print. What a happy little fellow! Hey hey! Tweet! Tweet! 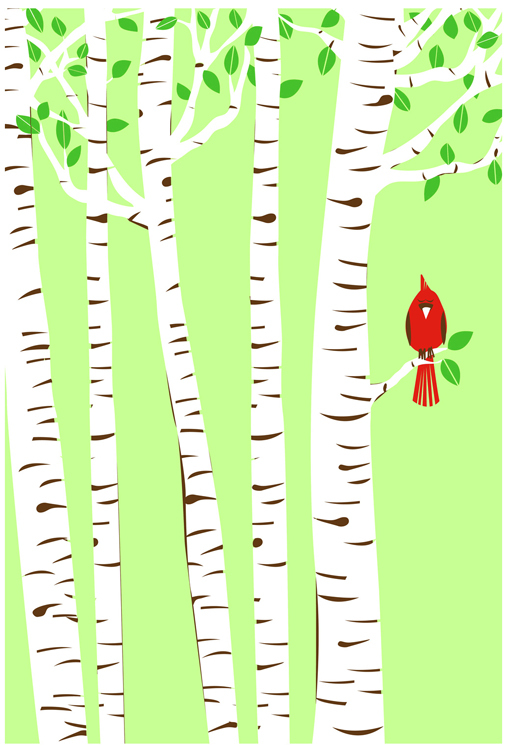 Spring Cardinal is a part of my new Seasons series. This is the sixth print in series of seasonal prints that I’ll be releasing. Ready? Here’s the mind-blowing part = there will be 4 per year. This year for the 2010 Seasons series, I am doing things a little differently, rather than making a new image for each season, I’ve decided to follow the same bright red fellow in the same scene, across all 4 seasons. We have lots of Cardinals here all year round. I love looking out of my window and seeing their amazing scarlet red color jumping out from wherever they are, and whatever they are up to. Although the original “Winter 2009” prints are sold out, I’ve printed a new edition, in a slightly different colorway titled “Winter Cardinal” to round out the first two seasons, (see the below photo), now available at my website here. 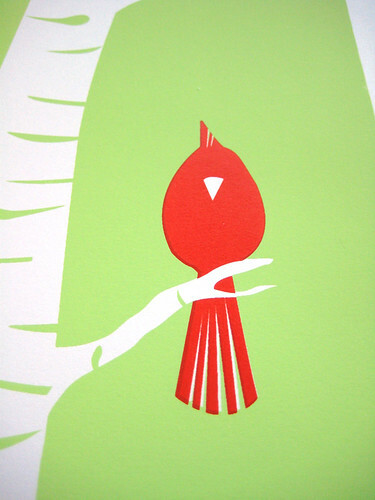 Summer Cardinal, the summer 2010 print will be available shortly thereafter. Keep a sharp eye out! 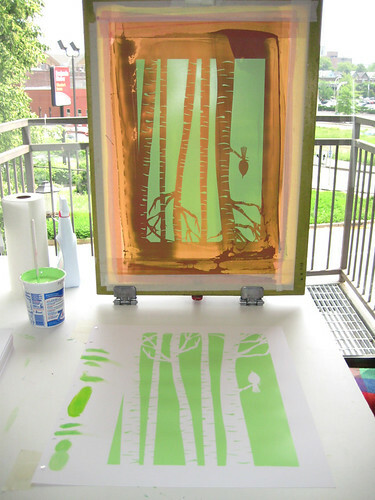 Spring Cardinal is my 4-color, all hand screenprinted art print with tender mint green, bark brown, scarlet red, and new-leaf green, hand mixed and non-toxic water based inks. All prints are hand signed and titled. 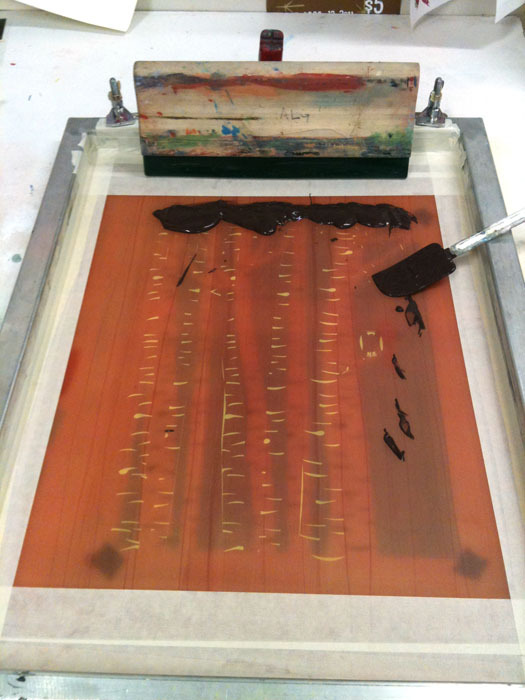 Additionally photos are selections from the hand screenprinting process. Size: 16 x 22 inches (39.4 cm x 55.9 cm.) Paper: archival Cougar, White 100lb cover weight. 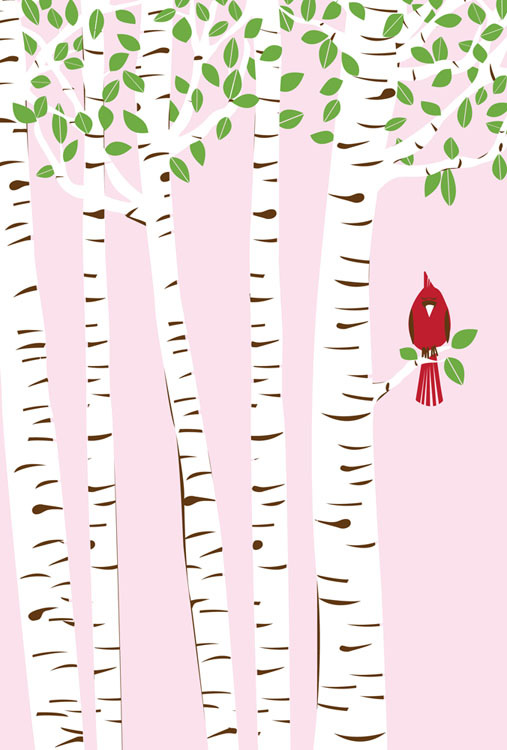 This new art print, Spring Cardinal is now available here, at my website. 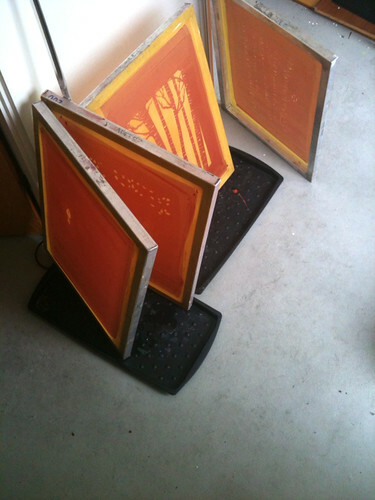 Screens drying for my Spring Cardinal art print. 1st color printed for Spring Cardinal. 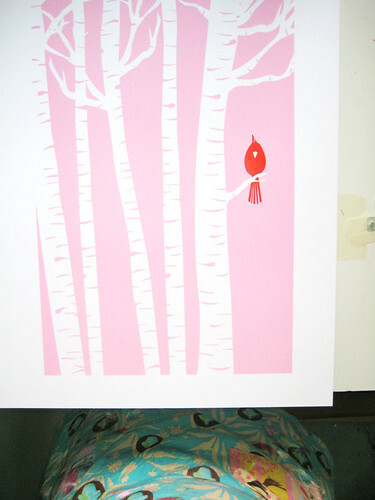 2nd color, the crimson Cardinal's body printed in my Spring Cardinal print. 3rd color, bark, beak & wing brown, printed for my Spring Cardinal art print. All done! 4th color printed and on the press for my Spring Cardinal art print. 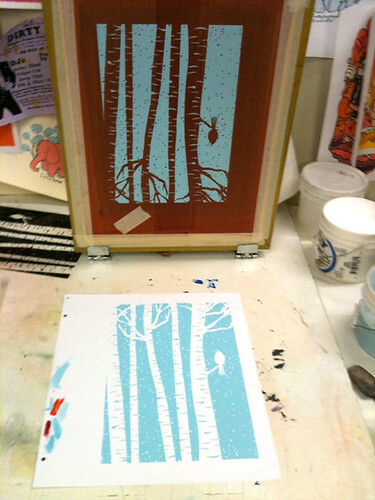 Hand screenprinted, 3-color art print 'Winter 2009', part of my seasons series and available now. Click for more info! Yay for cold weather, hot cocoas, snow and bar branches! Yes, that’s right, I mean it. I am a true Northerner because I love Winter. And my newest print is a love letter to an under-rated season. I just love that absolute quietness that falls with snow in a forest. We have Cardinals here in the winter, and their brilliant red always darts out from the winter pattern of color behind them like a signal, reinforcing the magic of a winter’s day. Hey hey! So you looking at my Winter 2009 art print, a part of my new Seasons series. This is the fifth print in series of seasonal, limited edition prints that I’ll be releasing. Ready? Here’s the mind-blowing part = there will be 4 per year. Winter 2009 is my 3-color, all hand screenprinted art print with icy blue, bark brown and scarlet red hand mixed and non-toxic water based inks. Edition of 119. Size: 16 x22 inches (39.4 cm x 55.9 cm.) Paper: acid free & archival Cougar, White 100lb cover weight. As always, here are a few photos of the print in progress, and you can see more at my Flickr page here too. 3rd & final color ink, ready to go!